Angela and Kelly spend a week catching up on current events. Kelly talks about what she saw on her trip to Japan, including the Weekly Shonen Jump Exhibition in Tokyo and lots of ads for Golden Kamuy, and Angela catches us up on some major comics news items from the past few weeks, like the failed Deadpool cartoon and what’s going on with the Batgirl film. Plus: Kelly talks about why she hates Funko Pops and we mourn the late Isao Takahata. Ran and the Gray World by Aki Irie (I said this was a josei series on the pod, but actually it’s seinen) – Just licensed by Viz! Isao Takahata (1935-2018) – check out some of his films like Pom Poko, My Neighbors the Yamadas, Only Yesterday, and The Tale of Princess Kaguya. Here is a great retrospective on his career. Episode 21: Black Panther, or why we need diversity! 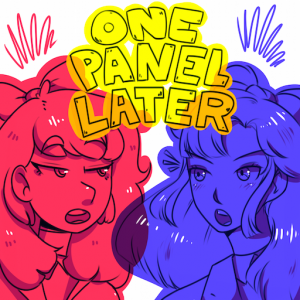 Angela and Kelly get heavy with a pod about diversity (or the lack thereof) in comics and manga. We’re covering Black Panther (finally), Marvel’s diversity SNAFUs, the homogeneity of manga, and how kids’ comics are filling in the gaps. Plus, cute stories from the library about why diversity matters to our kids and teens. Lumberjanes by Noelle Stevenson, etc.